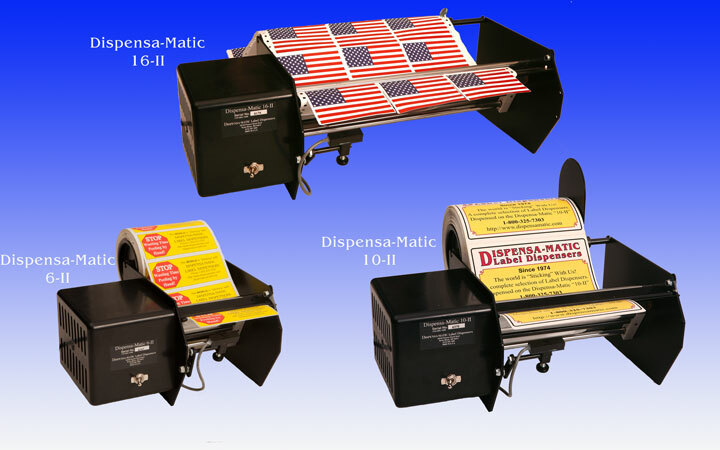 Dispensa-Matic DM-II Label Dispensers: are heavy-duty semi-automatic electric label dispenser for labels from 2″-15″ widths x any length. These label dispensers advances at over 6″ per second standard. DM-II machines are specifically designed not to wind up waste paper. This allows the user to dispense rolls up to 15″ Diameter (large roll adapter) without changing the waste! Loading is a “snap”, just feed the labels between the dispensing tables then through the patented feed-roll assembly and “snap” into place. The DM-II comes in three different sizes! Dispensa-Matic DM-II is an original design: from Dispensa-Matic! American made precision, quality, support, and longevity with over 35 years of experience from the same owner/designer! Need a custom label dispenser? (The advantage of being an originator!) Call us for a quote!